The Vikings bringing land-based salmon to the desert: “We are on schedule and aim to start construction at the end of this summer"
It may sound like something from a movie, but Lukas Havn’s dream of a land-based salmon production plant in Dubai is on the horizon. Now the Vikings are back – albeit without the swords. But this time armed with a USD 90 million, 5,000-tonne indoor salmon farm project in the UAE called Vikings Label. “I came here to escape the cold weather but ended up staying and salmon just happened,” said Vikings Label CEO Lukas Havn in a phone call to SalmonBusiness. He’s currently living in Dubai and running all UAE operations. He had a salmon import business there already and wanted to see how it could be improved. “Land-based is well received and is more “earth-friendly,” he said. Havn has salmon in the blood having worked in industry from a young age, from working at processing plants to more recently importing Nordic salmon to the Middle East. It took him two years set up Vikings Label with his dad Tore Havn. 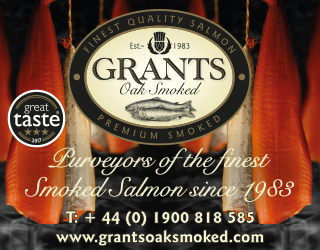 The father-son duo wanted to tap into the huge growth potential for salmon in Dubai, using land-based expertise from the Danish company Gråkjær to make a 5,000-tonne grow-out hatchery. “Danish company Gråkjær is working on the land-based fish farm. They come here nearly every month and have been working with us very closely. The technology, in my opinion, is settled. Land-based has failed many times but now it’s proven. I don’t feel the risk anymore. I’m excited by it,“ said Havn. “Banks are coming around as well, they are confident,” he added. His thinking is on the right lines, with the news that investment banks DNB Markets and Pareto Securities both raised the price target for the Miami-based Atlantic Sapphire earlier this year. “We also have a local water specialist,” added Havn. One could be forgiven for thinking that water is an issue in the UAE. Not at all said Havn. Despite an arid-desert landscape, UAE has 1,318 km of coastline with good fresh groundwater naturally filtered through the sand. The UAE relies heavily on imports to secure its food products. But salmon in the UAE and Dubai is fast increasing in its popularity. Last year, the company stated that said that surveys of soil conditions were currently being carried out on site at located in North Ras Al Khaimah. “We are on schedule – aiming to start construction at the end of this summer. We are building the hatchery first – which will be for a 5,000-tonne grow-out,” said Havn. 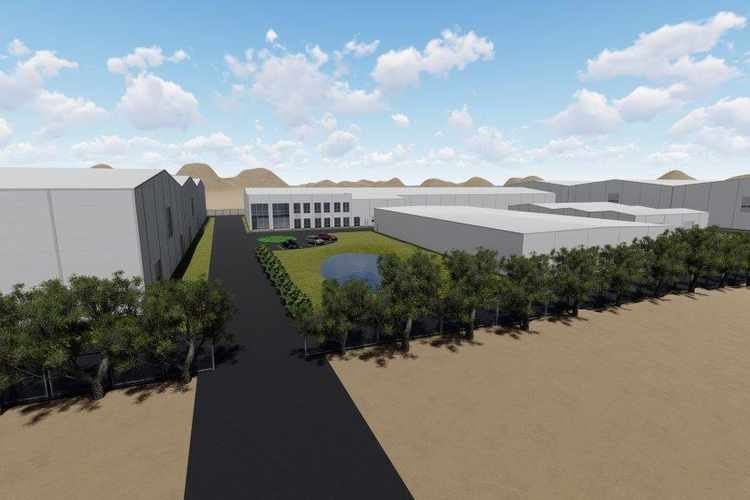 The company is aiming to complete the 33,000 m2 site by 2020. “Everything has been financed by ourselves up to now,” said Havn. He explained despite being far away from his native Norway, working in an international country had its benefits. Emiratis constitute roughly 20% of the total population, making UAE home to one of the world’s highest percentage of immigrants. “It’s been a learning curve doing business in the Middle-East, like learning everything from scratch, but it’s a lot of fun. We meet amazing people from everywhere in the world and the country is completely business-related,” he added. 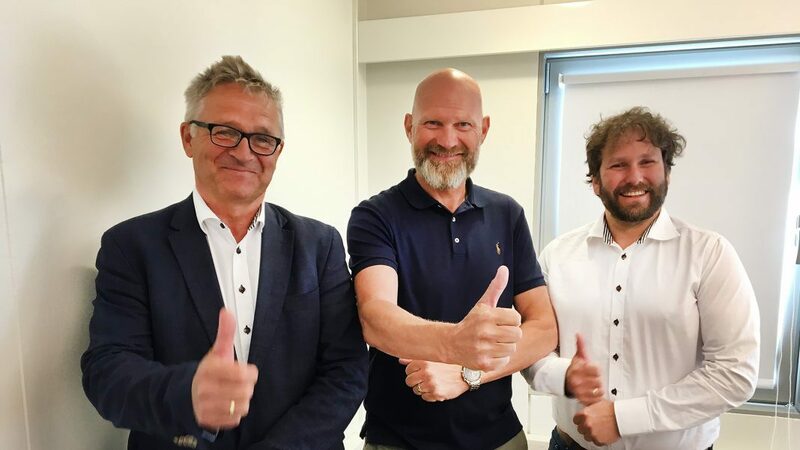 From left: Gråkjær’s sales and development manager, Bjarte Landro, Vikings Label’s CEO, Tore Havn and Gråkjær’s regional sales director, Roger Marøy. In 2017, the UAE’s imports of fish and frozen fish stood at USD 167.7 million and USD 58.9 million respectively. Last year, the minister of state for food security, Mariam Bint Mohammed Saeed Hareb Al Mehairi, said that the United Arab Emirates’ dependence on food imports was a major issue. “Food security is a big topic here, especially around aquaculture. The Ministry is putting a lot of resources in over the next 10 years,” said Havn. Havn concluded that he was confident he made the right choice when it came to the company name. “The Vikings Label name is well received, everyone knows about it because of the popular TV show. And I look like one,” he laughed.